“Fantastic Beasts and Where To Find Them” is a quintessentially British story in an obviously American setting. The move across the Atlantic not only brings a wealth of new mythology to the “Harry Potter” universe, but also Americanizes it — “Fantastic Beasts” is bigger, brighter and more intense than any of Rowling’s creations we have seen thus far. Where viewers are slowly guided through the wizarding world in the “Harry Potter” series — we learn as he learns — “Fantastic Beasts” thrusts us into the new facet of magical life with a full-grown protagonist with an established mission. The only newcomer to the world is Jacob Kowalski — a No-Maj that gets swept up into Newt’s schemes by matter of circumstance. Kowalski’s astonishment mirrors the viewer’s own. The newest chapter to J.K. Rowling’s world of magic is chronologically the first. Set in 1920s New York City, “Fantastic Beasts” follows Hogwarts-grad Newt Scamander as he ventures to America with a suitcase full of magical creatures (think Hermione’s coin purse — bigger on the inside). As it usually does, chaos ensues when a few of Newt’s creatures jailbreak and flee across New York City. Newt enlists No-Maj — or Muggle — Kowalski to aid him in his search for his beasts, as well as two American witches, Queenie and Porpentina Goldstein. While Newt and company search for his beasts, MACUSA (the American wizardry government) is dealing with a mysterious dark force. The investigation is led by Colin Farrell’s Percival Graves. Graves is also dealing with anti-wizarding radicals that permeate New York streets preaching about the evils of magic and the fear that all No-Majs should feel knowing dark magic exists. If this sounds overwhelming — it is. The first act of “Fantastic Beasts” is jammed full of world-building, character introduction and exposition. But once the stage has been set, “Beasts” takes you on a wild ride that ends in a stunningly visual climax. 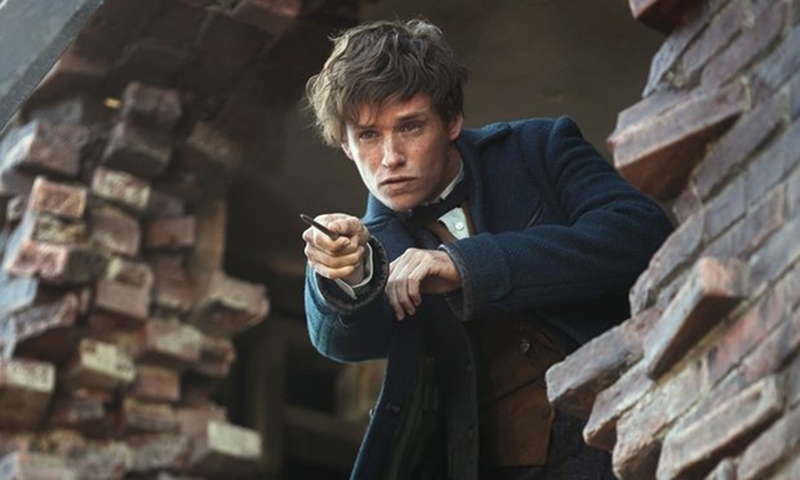 Eddie Redmayne’s Newt Scamander is the lead that will carry the newest series. He brings his typical outsider and quirky persona but downplays his charm that fans have come to expect. You don’t see Scamander truly open up until he takes No-Maj Kowalski into his suitcase to care for his creatures. The love and attention he affords each of them lets you know this protagonist is not the angsty, tormented hero Harry Potter, but a quiet yet heroic introvert that prefers the company of his beasts to people. While the finding of Scamander’s beasts helped to solidify his new relationships with Kowalski and the Goldstein sisters, the subplot made the movie better when it concluded. The main action of the movie — MACUSA’s fight to stop the destructive dark force — concluded in a blinding final scene that is equally beautiful and terrifying. David Yates, who directed the last four “Potter” films, brought the same vivid cinematography and understated emotion from those films to “Fantastic Beasts.” Yates is slated to direct all remaining “Fantastic Beasts” films, so the chance for a cohesive series is highly probable. The ending of the film wrapped up the film’s plot nicely, but left many a string dangling for the remaining four movies. I’m hoping Farrell’s Graves will make a reappearance. His manipulation of squib Credence and his devotion to MACUSA made him the film’s most intriguing character. “Fantastic Beasts” set the bar high for the remaining films and hints at familiar figures returning to the big screen as their younger selves. Whether Rowling and Yates can keep the new series’ momentum up remains to be seen, but they have certainly given fans something to get excited about with such a strong opening film.